Think you don’t need Cyber Risk coverage? Think again…One cyber event can shut down a business – one policy can help protect it. Data breaches and cyber attacks are becoming more common and have increased 62 percent in the last year alone. 31 percent of all breaches have occurred in organizations of 2,500 or fewer employees and 30 percent in organizations of fewer than 250 employees. 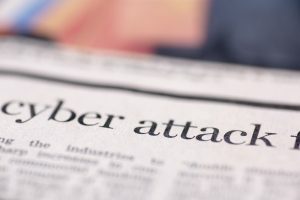 All industries are vulnerable to a data breach or cyber attack, including education, ﬁnancial services, nonproﬁts, professional services, manufacturing, hospitality and retail sectors. The average cost of a data breach has risen to over $6 million and includes costs related to business disruption, revenue loss, equipment damages, legal fees, public relations expenses and forensic analysis, as well as notiﬁcation costs that are legally mandated in 47 states. When your business experiences a data breach, the costs associated with that breach average $217 per compromised record. Unless you secure a dedicated cyber policy, your business is not likely to have adequate insurance coverage. General Liability policies also OFTEN DO NOT COVER activities associated with Website Publishing or Network Security. If your business uses the Internet, it is exposed to risk that may not be covered under your current commercial insurance policy. LEARN MORE about our Cyber Risk Solutions.